The formerly large, continuous brown bear population of the Carpathians has experienced a radical decrease in population size due to human activities which have resulted in splitting the population into the larger Eastern Carpathian and the smaller Western Carpathian subpopulations. In the Western Carpathians, brown bears came close to extinction at the beginning of 1930s, but thanks to both conservation and management efforts the bear population has begun to recover. 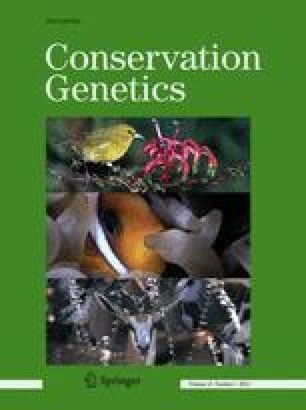 In contrast, the Eastern Carpathian subpopulation in Romania has never dropped below 800 individuals, potentially preserving the original amount of genetic variation. In this paper we present results of a genetic study of brown bear subpopulations distributed in the Slovak and Romanian sections of the Carpathians using 13 nuclear microsatellites. The documented level of genetic differentiation between the Western and Eastern Carpathian subpopulations reflects the isolation which lasted almost 100 years. Furthermore, the existence of two, different, genetic clusters within the Western Carpathians despite close geographic proximity indicates that human-caused fragmentation and isolation have resulted in significant genetic divergence. Although the subpopulations display an indication of genetic bottleneck, the level of genetic diversity is within the range commonly observed in different brown bear populations. The results presented here point out the significance of human exploitation to the population structure of this large carnivore species. Future management efforts should be aimed at securing and restoring the connectivity of forested habitats, in order to preserve the genetic variation of the Carpathian brown bear subpopulations and to support the gene flow between them. This study was supported by Slovak Research and Development Agency through financial support APVV-18-032105. Authors would like to thank to State Nature Conservancy of the Slovak Republic for providing the tissue samples of legally and accidentally killed animals and sample collectors from Slovakia and Romania for assistance with sampling. Also we would like to thank to D. Krajmerová, G. Baloghová for help with laboratory work; to D. Gömöry for advice with statistical analyses, and to L. Waits, T. Skrbinšek and P. Kaňuch for their valuable comments on the early version of this manusript. Thanks are due to Dr. E. Ritch-Krč for improving English.